Justice Charles Levin at the Society’s Annual Luncheon on April 14, 2016. Happiest of birthdays today to Justice Charles Levin! Justice Levin was born on this date in 1926, making him 90 years old today. Longevity characterized his time on the Michigan Supreme Court, too. 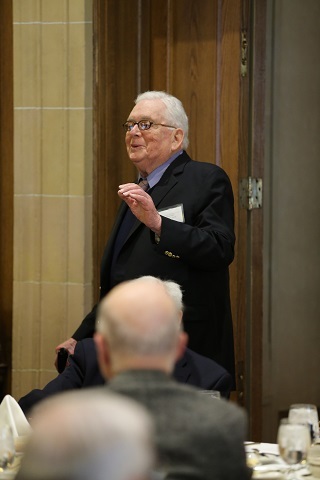 He served on the Michigan Supreme Court from 1973 through 1996, and is one of the ten longest-serving justices in Michigan Supreme Court history. Since 2000, Justice Levin has served on the Board of Directors of the Society. He resigned this year and has been succeeded on the Board by former Justice Mary Beth Kelly. To read more about Justice Levin’s career and to see his official portrait, visit his biography here.